Disco Dust – Also known as shimmer dust, glitter dust or sparkle dust. It’s brilliant, it’s pretty and it’s messy! I’ve had many questions regarding how to apply disco dust. It’s no wonder why. 😉 I do use it a lot. By no means am I an expert, but I’ll share with you how I go about putting disco dust on my cookies. I hope you find my suggestions helpful. 1. 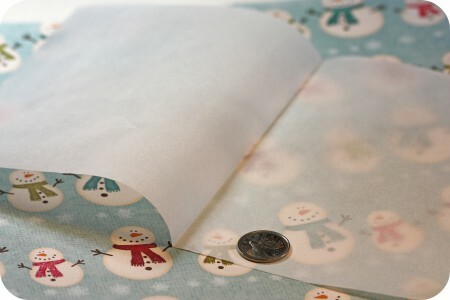 Begin by cutting a small piece of parchment paper to work on. Make a crease in it by folding the paper in half. Lay the paper flat again. To give you an idea of the parchment size there’s a quarter in the photo, however how big you make it really just depends on the width of your cookies and your preference. 2. Put the cookie on the parchment paper and gently shake the disco dust from the container onto the desired area of the cookie. The key is that the icing has to be wet; put the disco dust on right after you’ve piped the icing. 3. 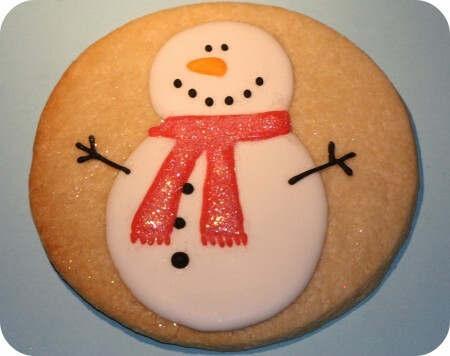 Shake off or dust off the excess disco dust when the icing has somewhat set or until it has completely dried (safer). If you’re working in a humid environment though, gently shake them off right away. The moisture in the air can make them stick. Do this by gently lifting your cookie, holding it over the parchment and container, and tilt it so that the excess disco dust falls back into the container and on the paper. 4. 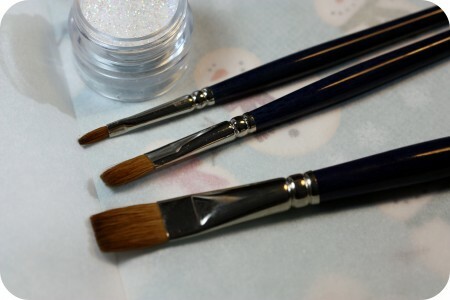 Take a clean paintbrush only used for this purpose and dust off the excess. I like using a flat, fairly short brush, which I have in 3 different sizes. For small grooved areas use the smallest brush, for larger flat surfaces use the largest brush. 5. Remove the cookie and lift the edges of the paper together. 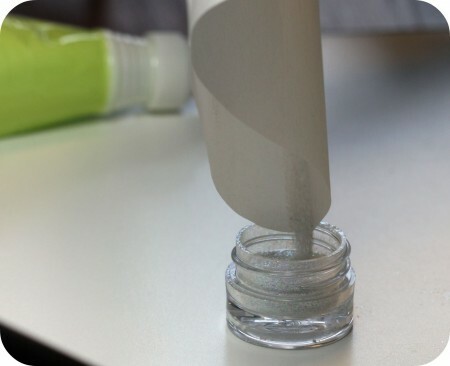 When the dust pools in the crease of the paper, pour the excess into another container. My recycled disco dust is poured into a different marked container as it’s only used for decorative purposes. 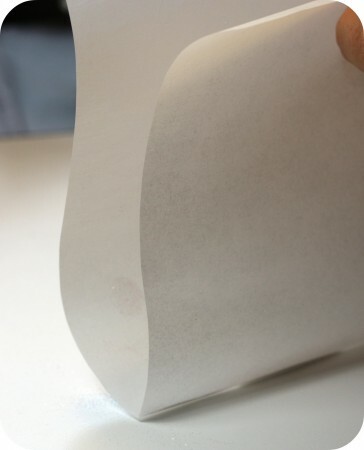 Shaking the paper gently also helps the dust fall into the crease. Some is lost, however, I found that it’s the best way to preserve most of the disco dust. There is another way I’ve done it, but it’s no longer my preferred method. I’ll share it with you anyways and you can try it if you like. 1. Cut out a piece of parchment paper a bit larger than the cookie (at least two inches larger all around), and then cut a hole in the center, about the size of the area you want to cover with disco dust. 2. Flood the area you want sprinkled with disco dust with royal icing. 3. Hold the parchment about 1 cm above the cookie, with the hole over the area you want to cover. Shake the dust gently onto the icing. The parchment catches the excess. 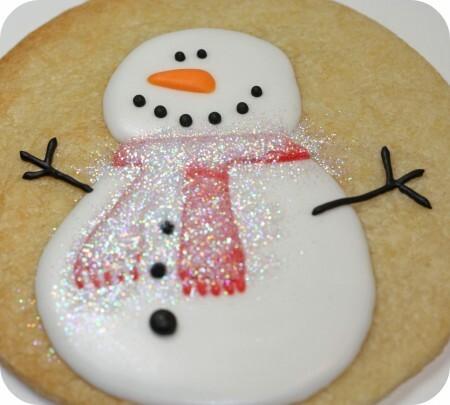 * For smaller areas I dip a paintbrush only used for food, into the disco dust, and then lightly onto the icing. * My favorite color to use actually looks white. It’s called rainbow disco dust . It seems to blend in nicely with the icing color underneath it. Hope that helps! If you have any ideas you’d like to share I’d love to hear from you below in the comment section. 1. Make dough. 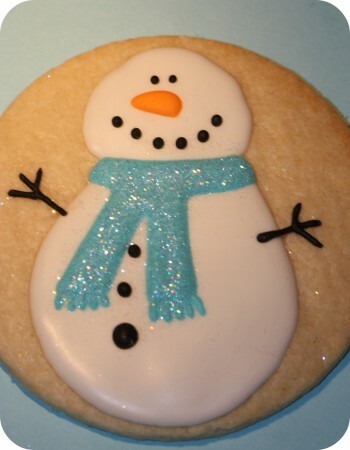 For a sugar cookie recipe see here. 2. 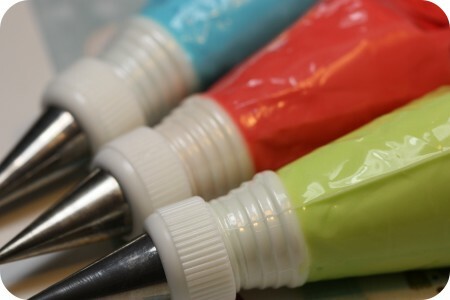 Make and color icing. For a royal icing recipe see here. 3. Pipe the body of the snowman. I used my Kopykake Projector to help me trace the image (which is from scrapbooking paper by the way). Let that dry for minimum 5 hours. 4. Pipe details on snowman such as face and buttons. Let dry for a few hours. (Since they’re only small bits of icing it doesn’t take long to dry). 5. Pipe the scarf of the snowman. 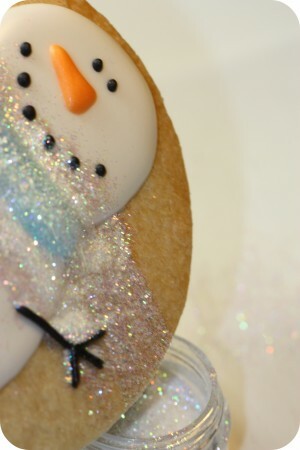 Add disco dust and shake off excess when the icing below has dried. 6. Put in bag with ribbon as desired. I love the look of disco dust and bought some but then I read somewhere that you should not eat it..I guess it is classified as non-toxic which means it won’t kill you but not recommended really for eating. Do you know anything about this? or is there a specific brand that is edible? 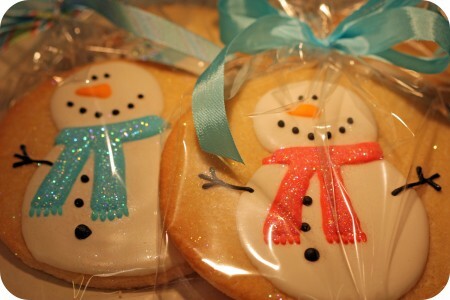 These cookies are adorable I would love to make something like this for Christmas. @ Renee – Kudos Kitchen: So neat! @ Suzanne Swanson: I mention in the post that it hasn’t been FDA approved, but since I’ve written the post there has been one brand which has been FDA approved; Sunflower Sugar Art. As far as I understand, non-toxic and/or FDA approved, to put it delicately, 😉 it moves through your body. Like anything that is not organic (such as fruits, vegetables etc. ), you make the decision what to eat. It could be debated that sugar would affect your body more than an item such as gold flecks in Goldschlager or disco dust, as sugar is actually processed by the body. My humble opinion is everything in moderation, be it donuts, other sweets or disco dust. I will also write a post on it when I get the FDA info., but hopefully this has helped. This is may first time on Sweetopia and have enjoyed it very much. Do you have any recommendations for using a stencil on a fondant cake. I would use royal icing, make sure the icing is at the right consistency – check by practicing on parchment paper first, because once it’s on the fondant, you could wipe it off if you made a mistake, but it may not look as polished. 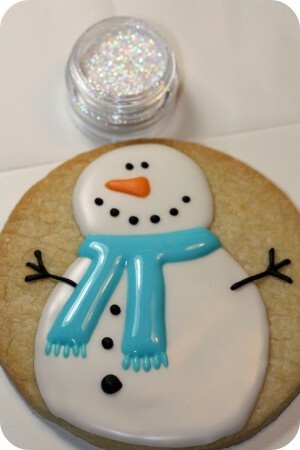 I’m a beginner at decorating, but I’d really like to make the snowman cookies above. 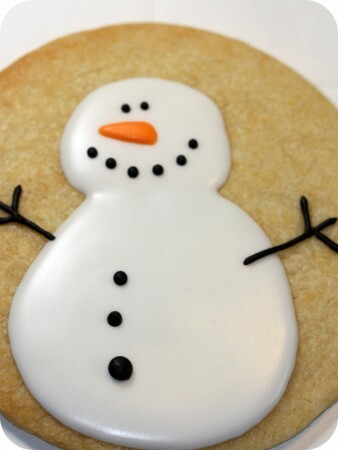 Can you explain in a little more detail how you piped the snowman body? Did you pipe the outline then fill in the center somehow? Thanks!! @ Lisa R.: Absolutely! That’s exactly what I did. 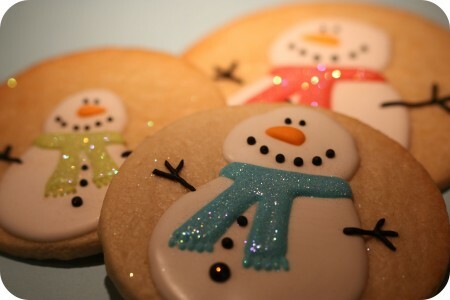 If you’d like to see a video, not specifically of the snowmen, but of the same process, check out my youtube channel. You can find it by clicking the little youtube icon on the top right of the blog. Have fun decorating! Hi! I know a bride who is considering using edible glitter, possibly Disco Dust or another, on her wedding cake…but is concerned that the guests will have glitter all over their teeth & not be happy about it. Do you know if it disappears into the bite or if this is a valid concern? @ Mimi: I think she actually does have something to think about there. 😉 If there’s disco dust on the flowers people usually take off, or if there’s just a small amount lightly sprinkled on, then I’m sure it will be fine. If there’s more of a coating of it on her cake, then yes, I think people might have disco dust on their lips or fingers. It will easily come off teeth, but does stick to the skin. What is your experience with either yourself or others eating cookies that have the disco dust on them? Thanks for your help! Have done some research and several sites say that while there IS edible glitter, Disco Dust is NOT edible & should be avoided. Thank you for your tips and tutorials-I had so much fun with my first trial! Where can I share a picture? Thanks for the awesome post. I live in the GTA. Where do you buy your Disco Dust?? Golda’s? I absolutly love all of your posts. You are so creative and inspire me to be as well. So glad that I found your blog! HI @ Athena Stevens: Bonnie Gordon’s or Amazon (have family on Can./U.S. border). Could you please tell me the name of the color on the disco dust you used for your snowmen?. Thank you in advance. Hi @ Paula: I’m sorry, I don’t know. =( Google is awesome, though, have you checked? Absolutely, @ Karina, rainbow disco dust. love reading your blog and trying out all of your decorating tips!! I wanted to paint a design on a dry cookie using disco dust, what would be the best way to do this? I am using a stencil to paint a hockey team logo on a cookie, a cougar actually , and I want it made of blue disco dust on white royal icing. Because it is quite detailed, I could not stencil it in royal icing and place the dust on it while wet, that’s why I wanted to paint it over. Super, @ Ellen Brown, thanks. Hi @ Ajda: If I’m understanding correctly, you want the royal icing to dry, then put disco dust on only part of the icing? 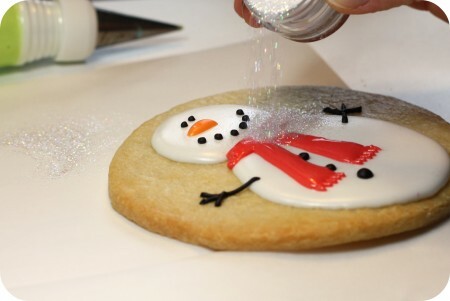 If yes, I would put a TINY bit of water on a paintbrush and paint the icing with it (not too much or the water will make craters or indents in the icing), and sprinkle the disco dust on. Not a foolproof method as you could get craters and the disco dust will not be as strongly adhered as wet icing would do. 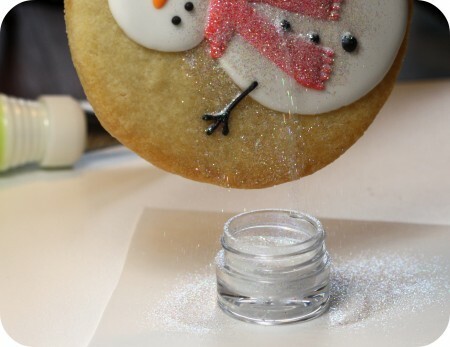 Another idea is to use clear piping gel to make the disco dust stick. 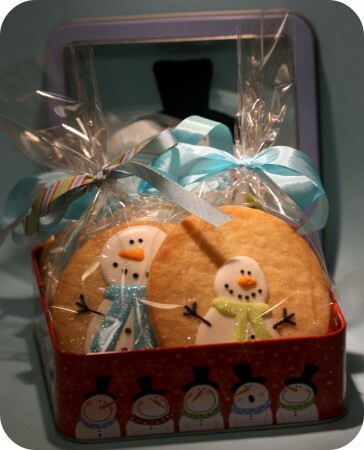 The down side to this is that piping gel never dries, so putting the cookies in individual bags is difficult. Boxes or laying them out on a platter would work. Hi Marian! I just wanted to share that I found disco dust, located in and shipped from Canada, on Rosette.ca . It is only $5.25 for a pot of it! Cool! Thanks, @ Andrea Luke, I hadn’t heard of them yet! This is an article about this very issue in the UK. 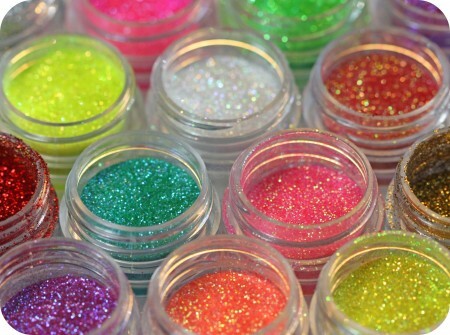 The Food Standard Agency has ruled that all “non-toxic” decorating glitter be labeled “non-edible” if it is not digested. 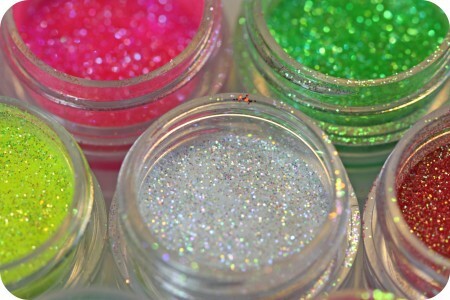 These Disco Dusts are made of plastic, just like craft glitter. If people feel comfortable ingesting small pieces of plastic and reflective material, then that’s fine for them. But they should know that they are in fact eating glitter, not some kind of glittery sugar. You can get the disco dust for $3.99 a jar at Cakeconnection.com. They also have the shakers for $.99 ea. They ship all over. I make Gem pops which has a main ingredient of Disco Dust I see you get a pile of the same questions I do regarding the NON-TOXIC issue. I see you posted that Sunflower sugar art is FDA approved, is this true!?? OMG if it is they are my savior!! lol now I won’t have people annoying me. HI @ Mimi’s Cakes: That was the last I heard, but it was quite a while ago and haven’t heard anything new! And, as far as I know, it was in the process of getting approved, hadn’t been yet. Sorry I’m not a better help! I am a Vietnam. I concern disco rainbow of sunflower sugar Art, because our company have used this product for gumpaste and royal icing by cover (sunflower sugar Art). You talked they are no-toxic means we can eat cookies cover disco rainbow. However, when I sent sample to test “migration test for foodstuffs”, the main component of sample is PET, not used as food. You can send to me docs to prove they approved by FDA ? I have been reading your cookie information for quite some time and love everything you create. You are a true inspiration. I live in Guelph, Ontario and recently went to Golda’s Kitchen in Mississauga and found Disco Dust. I haven’t been able to find it anywhere in Ontario. So I was really excited and purchased 6 colors. When I got them home, I immediately looked you up to find out how to use them and found a great tutorial on your site. I am however very dismayed as the label on the jar says for decorative purposes only as they contain Mica. So upon further research, I have found that Disco Dust is not edible glitter. I notice that you use it on top of your icing on your cookies. I was wondering if you know anything more about Disco Dust and whether your customers actually eat the Disco Dust. Any information you have would be so helpful. Nice to know Golda’s has it now – I’ve never bought it there before! You’re the first I’ve heard of “mica”, adn I’m assuming that’s a new label on the disco dust, although it has been labelled non-toxic already. I do have info. in my post above about it about it not being reviewed by the FDA and being labelled as non-toxic, but I wrote this post in Dec. 2010, so I’m guessing it has been by now! I will definitely be updating my post shortly.